We love our audiences to sing along - and have arranged some of our songs to include an "ad hoc choir". We can run workshops on singing and prepare an ad hoc choir to perform with us during a concert. We can cover about four songs in harmony, in an hour's workshop, ready to perform. We can also teach as we perform - so that we can get audiences singing at a concert without any rehearsal. We can also run workshops on how we approach arranging traditional songs. We have run choir workshops for corporate retreats, at conferences and festivals. Jodie has many years experience working as a singing teacher and choir director, holds a masters in music pedagogy and specialises in adult beginners. As acappella singers, we don't need much - you can just put us in a corner and we'll sing our hearts out. Actually, the corner is optional. Care of classical training - we can make a decent noise - we don't need amplification in small and medium venues. 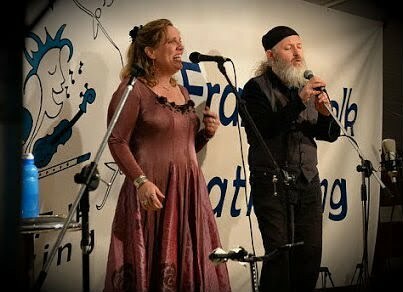 Emlyn and Jodie O'Regan live in the beautiful Adelaide Hills where they create acappella arrangements of folk and other traditional songs. They weave elements of jazz, blues, gospel, folk and classical choral singing into their eclectic performances. We have some high res print quality promo photos we can send you. Give us a hoy if you'd like some. I’m always blown away by their ability for one to take the lyrical lead and for the other to use the voice as a melodic/percussive instrument accompaniment. Wow. oh. wow. wow. wow. wow. wow. How can your two voices sound fuller than my six voice ensemble? That was so much fun. It was really lusty.